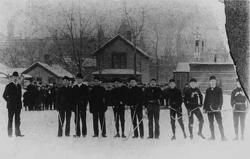 Ice polo teams were formed in St. Paul as early as 1883. Frank Barron, an accomplished ice polo player, formulated the first set of rules. Six players formed a team with the following positions: goal, coverpoint, cover goal, first rush, second rush, and center. Later seven players formed a team, although by mutual agreement a game might be played with six players on a team. A ball and a short stick similar to a present day field hockey stick were used. On-side play was not enforced. Unlike earlier hockey which used sticks set in ice for goals, ice polo employed cages similar to, but smaller than soccer goals. Many are of the opinion that ice polo evolved from roller polo, a popular game played on roller skates in the Twin Cities, Upper Michigan, Great Lakes area and New England in the 1880's and 1890's. The various positions cited above were the same designations as used by many of the roller polo clubs in the country. In the early 1880's roller skating was a fad in the county. In 1885 Minneapolis possessed fourteen indoor roller rinks, but by 1887 the interest had died out and only two remained. "ORGANIZATIONS THAT WIELD THE SHINNY STICKS ON ICE"
Up here in St. Paul polo is played by enthusiasts on skates. The Carnival Association is encouraging the game and a Northwestern league has been organized and prizes won. It is a very active and exciting game, six players on a side, and the nearest thing to it, off skates, is lacrosse or shinny. The championship medals last years were carried off by the Junior Carnivals Club of which Ed Murphy was Captain and that veteran polo player Frank Barron, rusher. Ed Dieter played center, W.H. Odell in goal, M. Pinger as covergoal, and W.H. Dickey as coverpoint. The defeated clubs were the Omahas (Royal Route) and Carnival Skating Club. The two local clubs this year are the St. Georges and St. Pauls. In the league this year are the LeLands of Minneapolis, of which D. Moore is Captain, and a local team form Stillwater. The fastest skater in the country are Ed Murphy, who has played for several club, a winner of several prizes, and Captain of the St. Georges; Lou Barron, Jim Smith, and McClellan, the last named a member of the LeLands. Lou Barron is Captain of the St. Pauls. The local clubs stand this year as follows: St. Georges: Frank Baron- first rush, Ed Murphy- second rush, Jim Smith- coverpoint, Chip Sherwood- goal, Gus Zenzens- covergoal, and Lou Barron- center. St. Pauls: Lou Barron- first rush, J. Stark- center, W.H. Odell- goal, S. Painter- covergoal, F. Marshall- coverpoint, and W.H. Dickey- second rush. Minneapolis LeLands: John McClellan- first rush, R.G. Moore- second rush, J.W. Urquhard- goal, Francis Marsh- center, Walter Haffelfinger- covergoal, and A.S. Heffelfinger- coverpoint. Walter "Pudge" Heffelfinger later became the famous all-time all American guard while playing football at Yale University. Teammates and coaches of his era thought the Hefflefinger was the greatest guard that ever played the game. He was a great football player thirty years after he had left college. A match game of polo has been organized between the Duluth Polo Club and the Zenith City Club. It will take place at the Central Skating Rink, foot of Fifth Avenue West on Friday night. The Zenith City team is a good club. Polo is a very poplar winter sport and considerable interest had been aroused here among the fans. The attendance at this initial game of the season promises to be large. F.B. Taylor will Captain Duluth and T. Moore will direct the Zeniths. Duluth roster includes: Berg, Morrison, McLennon, Thompson, Taylor (Captain), Vincent, Paine, Carey, and Meining. The Zenith City roster consists of: Calvary, Buxton, McDonald, Mcillhargie, Moran (Captain), Michaud, Maloney, Mitchell, and Grachau. In the 1890's ice polo continued to be a popular sport in St. Paul as many adult teams were in action such as St. Pauls, St. Georges, Centrals, Summits, Henriettes, Fort Snelling, Mascots, and Gophers. The Army Companies at Fort Snelling formed a four teams league. In addition, several youth teams were playing the game among them being St. Paul High School, Spauldings, Summit Juniors, and Interurbans. Minneapolis had a few teams in the adult class such as the Polo Club and the Acorns. Owatonna, Stillwater and Superior Wisconsin were playing the game at this time. Large crowds followed many of the games in St. Paul which were played at the following outdoor rinks: Broadway, Como, Aurora, Edgerton, Central, Ramsey, Hill, Palace, and Victoria. In 1893 there were four covered roller rinks that were flooded in the winter and used for ice polo contests as follows: Jackson, Summit, Wigwam, and Exposition. On February 7, 1893 the St. Paul Henriettes defeated the Duluth Polo Club 2-1 at the indoor Glen Avon Curling Club in Duluth in a game billed as being for the state championship. 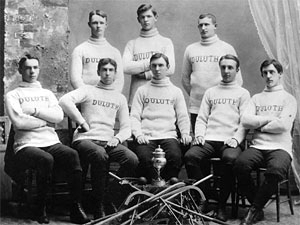 In January of 1894 Duluth played the Henriettes in a three game series for the state title. The Henriettes lineup included Keiffer, Ringwald, Pfeiffer, Murphy, Newson, Vance, Mead, Eagan, and Sherfenberg. During this era seven players usually constituted a team, but on occasion only six were used. The Barron and Murphy families, each with several members playing, were an important part of the ice polo sort in St. Paul. There were two Edward Murphys involved in St. Paul ice polo and ice hockey. "Big" Ed Murphy was a Canadian hockey and lacrosse player, while the other Ed Murphy was an American who did not care for the ice polo sport and was instrumental in starting ice hockey in St. Paul. Kieffer, the goalie, the Barrons, the Murphys, Newson, and the fast skating Davidson were among the best players during the heyday of ice polo in St. Paul. Harley Davidson was a world reknown speed skater. 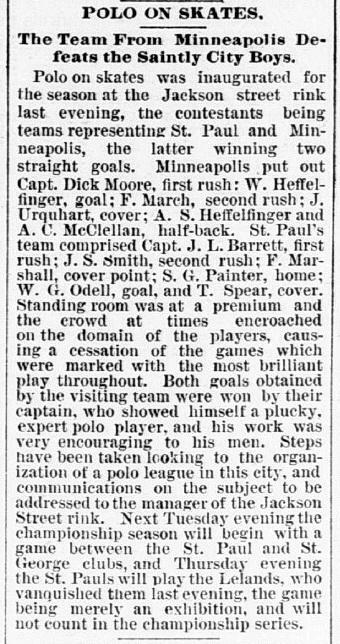 For the season of 1894-1895 the Twin City Ice Polo League consisted of the Henrietts and Summits of St. Paul, Fort Snelling, and the Acorns Polo Club of Minneapolis. The Summits and Henriettes finished the season is a tie after their scheduled tournament ended in a controversy. Ice polo continued to be played in the large cities of the state with St. Paul being the leader, but by 1896 ice hockey which had been introduced to the area during the season of 1894-1895, had gradually become the preferred sport and interest in ice polo began to decline. The last state ice polo tournament, won by Duluth, was held in 1899 and by 1901 ice polo had been replaced by ice hockey, a game better suited to a smaller ice surface and indoor rinks.